It’s possible to improve your business and increase the amount of revenue that each employee produces if your outsourced IT provider has the right approach. 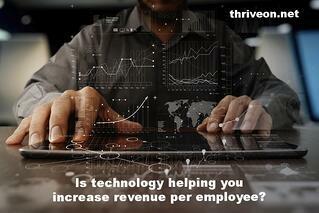 As you contemplate this concept you might be thinking of all the ways that people interact with technology, and that certainly plays a part, but you might not have considered how you can improve the revenue to employee ratio just by having a better IT experience. Whatever your business, downtime is dollars when your network is down and your employees can’t work. In addition to work activities being stalled or stopped, it’s probably going to cost something to fix the source of the interruption whether it’s a hardware or software failure or a security breach. Employees are put under stress when they have to work in conditions that hamper their ability to do their jobs. On the customer side, frustrations can mount when you are late in providing products, services, or the real time information they need to meet the needs of their own customers. Upfront, it might look like it’s going to cost more to partner with a company with a proactive approach, but in the long run you’re likely to net more revenue employee because you’ll have maximum uptime. It’s no surprise that working with a well thought-out budget can help control spending, avoid cash flow problems and make best use of your resources, including your people. Some IT vendors offering managed services have the appearance of fixed costs, but what you are receiving may not be comprehensive enough to help you truly budget. Outsourced IT department services that include unlimited support and work proactively to implement best practices are essential to effective budgeting. The other component is an IT strategy that plans for the future with costs and a timeline. Looking ahead will help you to make better decisions about your IT investments and avoid unnecessary downtime helping your company to realize more revenue per employee. When you look at how your company is managing risk, you should be including cybersecurity in the discussion. If you experience a security breach, the impact could include downtime, costs for remediating the incident, litigation and legal fees, and loss of reputation to customers and employees alike. You might find yourself paying your managed service company to get you up and running again, even if you thought that they had cybersecurity covered for you. If you have outsourced IT services that are guided by a proactive approach, they are going to be diligent about cybersecurity, and invest in the cutting edge tools that will best maintain a strong technical perimeter. Effective IT security helps your company net more revenue per employee because your risk of downtime and costs due to cybercrime are decreased.